There is one product that you will find in my house, purse and car in abundance: Lip Balms. I am not a lipstick wearer, I rather have a great lip balm that helps smooth and protect my lips. That is why I love the Carmex lip balm line so much. They offer a wide variety of products and they all work wonders. 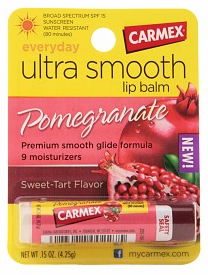 I recently had the opportunity to review their latest lip balm... Pomegranate Ultra Smooth. First of all it smelled great! The Pomegranate Ultra Smooth also offers SPF 15 protection, is water resistant (up to 80 mins) and has 9 different moisturizers. 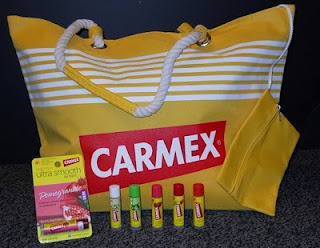 Carmex lip products are my obsession and that is why I enjoy blogging about their products. **WIN IT** Now here is your chance to WIN your very own summer Carmex Prize Pack (pictured above). Just fill out the easy Rafflecopter below to enter! Ever since the new Carmex products came out, the lotions, I just couldn't get enough of their products. I also love the chapsticks. Carmex just gives you this nice soft feeling after you apply it on your skin! I've never tried them! But I would love to! You've just reminded me I need to get my carmex out haha! I would love to try them! I have never tried their new flavors. 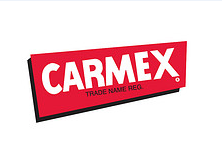 I've only ever tried the original carmex, but I sure do love it. It works good for keeping my lips smooth. Carmex is a product that works well and is priced right. I always trust Carmex for quality. Found you on the blog hop!!! They look like glues. Cuuuute! I love the Carmex lotion for my dry skin. Carmex products also smell so good. It actually fixes chapped lips! I love Carmex because it makes my lips feel better. I used other lip balms when i noticed that several of my students pulled Carmex out of their purses. I bought some the next day and I haven't used any other since. There's just no comparison! I love Carmex because it keeps my lips kissably smooth. Plus, whenever I have the tube out, I rub a bit on my cuticles. Waaaay better than those expensive creams! Carmex is one of the few moisturizers that actually work! I love it! It works really well and comes in fun flavors! I love carmax because it helps my lips not dry out better then all the rest. Thank you so much for reviewing the latest products and offering your readers a giveaway. Congratulations to the winner!